Thank you for supporting the school! 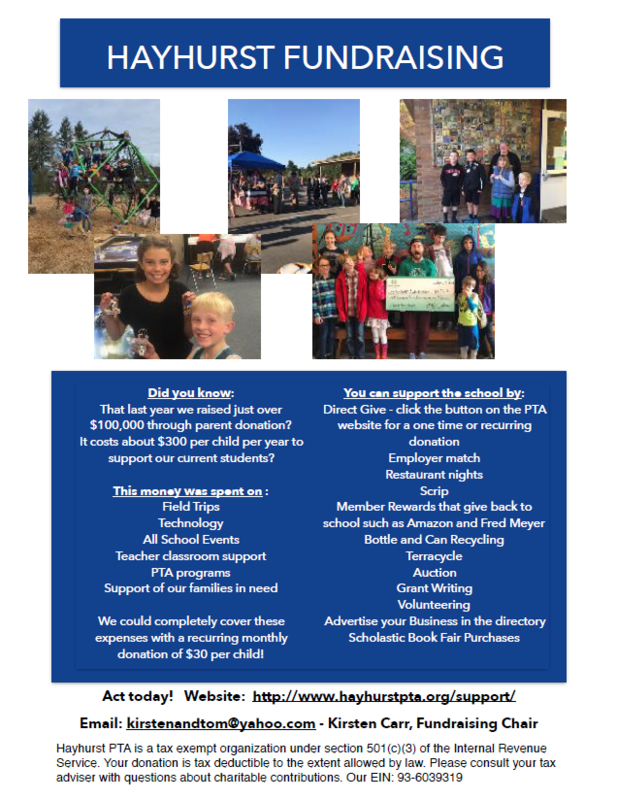 You can now donate to Hayhurst PTA by credit card either as a one-time payment or as a recurring, monthly donation. Simply click the Donate button to get started. This year we will not be asking parents to pay for field trips! Help us keep this up by donating to the school! Direct give is a great way to do it. It costs about $300 per student per school year to support our current students. Did you know that the Hayhurst PTA is a registered with a few community rewards programs (Fred Meyers and Amazon)? If you shop at these stores you can support our school while you shop and it won’t cost you a dime! Fun events at local restaurants where a percentage of sales event goes back to our school. Either at our school through our WATT program or through local vendors, you can support the school through recycling! Purchase​ ​a​ ​Mobile​ ​Subscription​ ​to​ ​Chinook​ ​Book​ ​Using​ ​Our Special​ ​Fundraising​ ​Link to Support Hayhurst Elementary! Box Tops for Education, Giving Snowman, Corporate Match, and you tell us!